Secession Movements Pick Up Steam! Examine Europe’s Latest Secession Movement: Venice, for a telling indicator. “An organization representing a coalition of Venetian nationalist groups, held an unofficial referendum on breaking with Rome. Voters were first asked the main question -“Do you want Veneto to become an independent and sovereign federal republic?” -followed by three sub-questions on membership in the European Union, NATO, and the eurozone . . . Note the significance of wanting to be part of NATO and the EU. Next, look at the more widely reported effort, in the land of “Braveheart” William Wallace. Scottish secession remains unlikely, but momentum is with the schismatics provides a more stately viewpoint from the Commonwealth. “After months of comfort for the pro-unionist ‘Better Together’ campaign, the most recent polls point to a tighter race with 40 percent of Scots supporting secession. With six months to go, the momentum appears to be with those seeking an amicable divorce. A video from the Carnegie Council gives a spin in Which Separatist Movements Will Succeed, which plays down the urgent motivation for “FREEDOM” for an evolutionary approach. An essay out of Wharton, Is Secession the Answer? The Case of Catalonia, Flanders and Scotland, points out the obvious, while illustrating the problematic. “It may seem paradoxical in an age of global communications, but the revival of regionalism “is a global phenomenon,” notes Jacob Funk Kierkegaard, a senior fellow at the Peterson Institute for International Economics, a Washington, D.C. think tank. Today’s high-speed technologies, including the Internet, “enable people to start a campaign and get out their message” quickly and repeatedly to like-minded people who might have harbored such desires in private. The Spanish situation, by contrast, the establishment would have you believe the militant Basques ETA nationalists harbor violent resolve. The YouTube Thousands March In Spain In Support Of ETA, reports that the EU labels this movement as terrorists. Therefore, it comes as no surprise that the Catalan Sovereignty Claim Blocked by Spain Constitutional Court is but a spillover effort to discredit the Catalonia’s claim. “Sovereignty is “not contemplated in our constitution for nationalities and regions that make up the state” and no one can break the principle of the “indissoluble unity of the Spanish Nation,” the ruling said. Such illustrations, all exhibit unique local concerns and grievances, while sharing a basic distrust of national authority. What stands out is an anserine eagerness to remain part of the EU and NATO. This factor may be a distinctively European trait, which seems to be lacking in the proper understanding that the surrender of national authority to a body of central banksters, social technocrats and empire military mercenaries, is the fundamental cause of popular dissatisfaction. 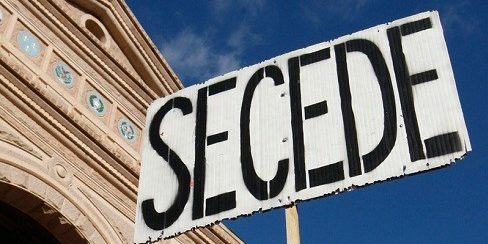 Pat Buchanan in the article, Is Red State America Seceding?, provides numerous other European examples of discontent, then goes on to cite secession initiatives in the United States. It is striking that our countries unique experience has a shape difference from the blue-blooded patricians’ clashes that mark the history of Europe. Because of this difference, the indigenous cultures on the continent have never developed the same passion of individual liberty, which is inborn in the American revolutionary spirit. Applying the same principles defended in the View from the Mount essay, Secession Movement Ready to Take Hold would serve our European cousins well, in breaking up the EU and their NWO oppression. “Governments fall, while a consensual nation state can still survive. With the destruction of an accepted traditionalistic national identity, time-honored heritage becomes the target of dictatorial “do gooders” who facilitate subjugation of independent self-governing states. Libertarian and author L. Neil Smith argues, “What happened in America in the 1860s was a war of secession, a war of independence, no different in principle from what happened in America in the 1770s and 1780s.” Compare most of the secession movements in the 21th century as half measure efforts that are not willing to take on the yoke of the globalist central banking financial system. The lessons presented in the Radical Reactionary article, Representation, Secession and Taxation should be applied and adopted by the European secession movements. “As discontent rises and practical solutions evaporate, that dirty historic sentiment begins to bubble to the surface, SECESSION. Russell D. Longcore provides a standard, when secession is a vital and justified option that many would accept. Discontent is not enough to overthrow the tyrants, who have definitively proven, that a European Union based upon top down authoritarianism is a lawful substitute for locally ruled government based upon common ethics and cultural heritage. The dramatic rise in opposition to the ruling elites is most encouraging in the eternal struggle against despotism. However, the European socialist welfare model has produced generations of soft stock and irresponsible subjects. Surrendering national sovereignty was the monumental failure of the post war era. Open borders to a confederation of dissimilar ethnic groups, attracts the disparate and incongruent, which builds even more pressure for secession. As it stands today, the prospects for successful secession movements to attain their independence and autonomy are slim because each are fragmented. The correct and necessary element for separation, must be based upon, the dissolution of the European Union and the elimination of the central banking system, under the control of the international banksters. Countries need to exercise their proper authority to coin their own currencies and maintain low taxation levels that fund minimum governmental functions. While such a goal and objective is justified, the globalist controllers will not allow a serene exit from the monolith that they created. Marginal regional self-rule may eventually be reluctantly recognized, only if the basic leviathan structure remain intact and accepted by disgruntle camps. Notwithstanding, that approach can and will never bring about a restoration of national self-determination. It is time for secession movements to unit and coalesce around a few fundamental principles, which they all share. The regional concerns are issues for local administration. Taking on the monster of globalist governance is a universal task. Consequently, the undertaking domestically is to build ground swell defiance that moves past a modest grassroots opposition to incorporate the bulk of the rapidly declining middle class. This genuine moral majority must be willing to marginalize the federal government and restore the rightful authority of individual state jurisdiction. If timid and docile Europeans are engaging in secession movements in such significant numbers, what is the excuse for industrious and energetic Americans from doing the same? This was the country for the home of the brave. Now is the time to restore that outlook with direct action.